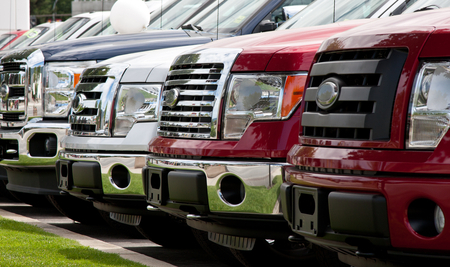 When it comes to buying a new truck, many people head straight for the bottom line. Negotiating the best keys-in-the-hand-drive-it-off-the-lot price is usually the focus. While getting a big discount off the sticker price is great, the purchase price is really just one piece of the puzzle. Paying more for your new truck could save you almost 10 percent— thousands of dollars in the long run, according to Edmunds.com. But why? Think of the purchase price as the outside frame of that puzzle. It’s a place to start, but without all the little individual pieces inside, you can’t see the whole picture. The true cost of ownership (TCO) of any vehicle includes the extras. Not the leather seats and fog lights or the tow package and the heavy-duty suspension— the extras in the form of insurance coverage, taxes, fuel consumption and maintenance. When you start adding the little pieces, the real price of ownership starts to take on a different whole. AAA Public Relations Manager Ginnie Pritchett reports annual maintenance and repair costs, for instance, jumped almost five cents per mile driven in 2013 over 2012 prices. That jump brings the average cost per mile to operate a vehicle up to more than 60 cents per mile— a figure that is higher in most trucks. Is doesn’t matter whether you are considering a 2012 Cadillac Escalade EXT or a 2013 Chevy Silverado, discovering that TCO is essential if you really want to get the best deal. Naturally, the Escalade has a higher price tag than an extended crew cab Silverado, but it might surprise you to learn that maintenance and repair over a five-year period is higher for the Silverado. Thinking about adding aftermarket off-road tires? Add another 10 percent into the operating mix for lower fuel consumption, according to a 2010 Car and Driver 2010 road test. Comparing the sticker price of a 2013 Escalade ($63,000) to a 2013 Silverado 3500HD ($31,500) aren’t even close, but if you go to DriveTime used cars and compare the price on a Ford F-150, a Dodge Ram and a Chevy Silverado you’ll find a similar market. When it comes down to it, digging deeper into the TCO may be the deciding factor in your truck purchase. The picture is starting to take shape as you add the puzzle pieces for fuel consumption, maintenance, insurance and taxes. So if you find a Ford F-150 for under $22,000, take the time to ask about taxes, check into the cost of insurance coverage and use an online calculator to estimate the annual fuel consumption and repair costs. Average fuel consumption is just a starting point. Personal driving habits influence maintenance and vehicle mpg, quite substantially. Jack rabbit starts and stops, double clutching, off-roading or towing the horse trailer to the rodeo grounds every weekend, all drastically reduce your averages and increase repair expenses. Whether you are looking for a loaded 2013 Cadillac Escalade EXT or a 2012 Ford F-150, start with the sticker price. But don’t stop until you have all of the pieces of the puzzle to give you a full picture of the true cost of ownership. Steven Butler is a classic car collector and automobile enthusiast from L.A.